After a disaster that causes structural damage, your building will be assessed to determine the course of action moving forward. If the building is too damaged to be rebuilt safely, the building inspector will recommend demolition, followed by reconstruction. The loss of your home or business is a traumatic experience, and the team at Boston Board Up Services strives to make the experience as painless as possible. After the initial response to your emergency, our team can demolish the structure to begin the healing and rebuilding process. After an incident occurs, emergency services will arrive at your home or business to assess the situation and eliminate any immediate dangers, whether that means extinguishing a fire or beginning the process of removing fallen trees. The building inspector will perform an extensive inspection of the structure and its foundation to determine the level of damage absorbed. If the building is too damaged to continue standing, certain steps will need to be taken in order to proceed. 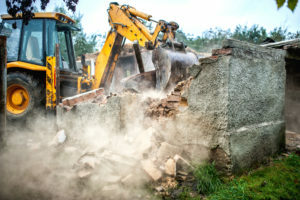 Before the structure can be torn down, permits will need to be acquired from the town offices approving the process, and necessary dumpsters and machinery will need to be delivered to the site. Utility companies will need to be contacted in order to disconnect water, sewage, gas, electric and propane services in order to begin removal safely. Once the project is authorized to begin, the structure will be taken down piece by piece, in an organized and logical fashion. Beams that are compromised high above the ground will be removed before secure materials. After the building is completely demolished, the debris will be cleaned and brought to landfills or recycling facilities, and a temporary fence will be placed along the perimeter of the property to keep wildlife and intruders out of the site. Signs will be posted along the fences designating the property as a job site, including copies of work permits obtained from the building inspector. If your building has suffered extensive structural damage and must be demolished, contact Boston Board Up Services today. Our representatives will provide quotes for demolition and reconstruction. We understand that this process is difficult, and will be more than happy to assist you in any way we can. Our offices are open 24/7. Boston Board Up Services can be reached by calling (800) 949-9113 or by filling out our online contact form.